Energy storage is a critical component of making widespread clean transportation a reality and for increasing the amount of distributed power generation in California. Without an advanced energy storage system like CODA’s, installing a fast charger increases energy demand and operational costs at the site, making projects economically infeasible. Environmental Leader, the premier trade source for energy, environmental and sustainability news, has recognized CODA Energy’s efforts to spur innovation in smart charging and vehicle-to-grid integration with its Third Annual Project of the Year Award. Smart charging involves one-way communication and power flow from the grid or renewable energy source to the vehicle. It allows EV owners to charge quickly when energy prices are low, and carefully manages the energy source and amount when energy demand is high. Vehicle-to-grid integration takes this a step further; it involves two-way communication as electricity flows from the grid to the EV battery and from the EV back to the grid. This functionality makes it possible to use the EV battery as a source of emergency back-up power, and to reduce peak-power demands and enhance grid stability. Using the CODA Core™ energy storage system (ESS) in conjunction with the Geli energy operating system, the City Hall’s chargers intelligently determine when to use solar energy generated from parking structure’s rooftop solar PV panels and when to draw stored energy (solar or grid sourced) from the ESS based on the price of power and energy, determined by source, time of day and peak demand of the facility. By automatically switching between battery stored power, solar generated power, and grid power, the system quickly optimizes the source of energy based on supply and demand. By managing energy sources, the ESS reduces additional utility electricity costs created by the addition of EV charging and extends the usefulness of solar generation by storing excess generation inside the batteries. 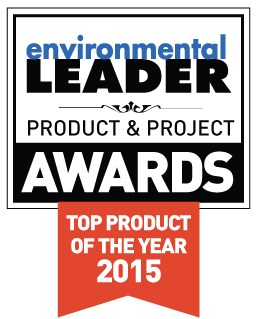 CODA Energy is proud that our project stood out among the dozens of entries from top companies; previous Environmental Leader Award recipients include DELL, Johnson & Johnson, General Motors and Schneider Electric. The judging body was made up of industry and academic experts, corporate leaders, analysts and sustainability thought leaders. We are truly honored to receive this validation of cleantech innovation and are excited to share the many successful projects we currently have in the works in the coming months.